He was in a playful mood. You’re a cheeky little boy! He’s been a UNICEF ambassador since his early football days – setting up the Sports Development program to benefit underprivileged children many moons ago. 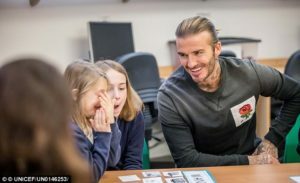 And for World Children’s Day on Monday, David Beckham was throwing himself into his charity once more as he was seen asking children about the issues that affect them on a visit to a London primary school. 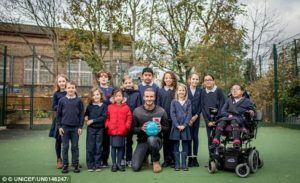 The 42-year-old football superstar rocked an English rose emblazoned shirt from his own clothing range as he visited the Kentish Town Primary School to ask the children about what they want to see in the future – as he was met with cheeky responses. The system mainly benefited people in the south of the country. Our favorite bloggers are rocking them, and we’re oBsSeSeDd with them… S.T.R.I.P.E.S!!! David was looking typically dashing, with his hair scraped back while rocking the top from his range which added to his fresh sportsman look. As well as chatting to the pupils on his visit, and taking part in various games, David also got the children involved in sports activities. In a video posted to David’s Instagram, the star asked a group of youngsters about things they would like to see in the world on his visit, and while some answers were insightful, others were typically hilarious. She has written an insightful account of the modern art world. Some workers will lose their jobs as machines take over. Can you take over the cooking while I walk the dog? I’ll take over from you for a moment. Jane took over as director after Richard retired. When he died, his son took over as CEO. He took over from Tony as head of department last year. Then, in a more lighthearted fashion, David asked the school kids how they think adults will get around in the future. One boy excitedly said a spaceship, while another girl said by unicorn, to the delight of the group. The documentary takes a lighthearted look at the world of filmmaking. Spain last week and Germany this week – he gets around, doesn’t he! At the age of 85 Milly still gets around quite well. We’re just discovering the delights of being retired. Enjoy the delights of rural Spain. Another noted that their parents should follow the same rules they set them. David has been an ambassador for Unicef since 2005, setting up 7: The David Beckham UNICEF Fund in 2015 to commemorate his 10th anniversary of working with the organisation. The fun aims to help children in danger, and that year David visited also children who were living in terrifying circumstances in Cambodia. How did we get onto this subject? Can we move onto the next item on the agenda? Ask a grown-up to help you. Ask a grown-up to cut the shape out for you. Australia declared its support for the agreement. I was in Germany when war was declared. A state of emergency has been declared in the province. A statue has been built to commemorate the 100th anniversary of the poet’s birthday. The ceremonies commemorated the 20th anniversary of the founding of the school. A huge bronze statue commemorating the poet stands in the main square. It is very important to make a will, whatever your circumstances. I think she coped very well under the circumstances. The circumstances surrounding the child’s death are being investigated. It’s amazing that they did so well under the circumstances. The circumstances of this case are unusual.